Born in Bolivia of Lebanese decent, Kathia has enjoyed the art of dance since childhood. Her love of salsa developed at the age of 20, when she co-owned Providence based JJ Latin Dancers. During her Salsa formative years, she began taking lessons in New York with various world renown instructors including Mambo King and Queen Eddie and Maria Torres, Santo Rico Dance Co., Yamulee Dance Co. and many more. She has taught and performed at the NY, Boston and CT Salsa Congresses, the Dallas Bachata Festival, the Las Vegas Salsa Congress, the Aventura Dance Cruise and many other local and national events. Kathia continues to develop her love for teaching and choreographing performances at Mambo Pa Ti Dance Company, where she re-connected with her childhood friends (Carlos Gonzalez and Irina Abramov). Interested in joining one of our classes? 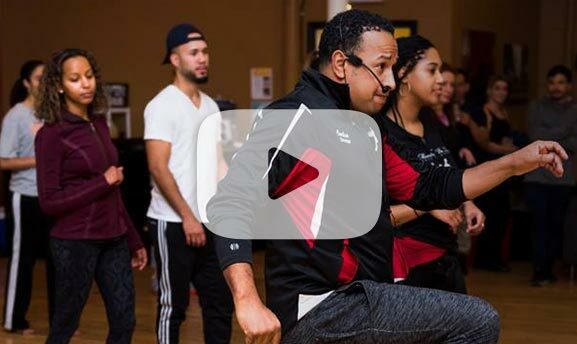 Drawing from years of training and performance experience, Carlos Gonzalez and his team of dance instructors lead a variety of lively Latin dance classes. Got questions about our classes? Want to book us for a performance, workshop or community event? Give us a shout-out by phone, e-mail or social media.